Achim von Oetinger’s family has been growing grapes around Erbach in the Rheingau since 1828. The estate was divided between brothers Robert and Eberhard in 1958, but was subsequently reunited. Presently, Achim, Robert’s grandson, is in charge of the vineyard operations and winemaking. Quality has been on the rise consistently with Achim and his wife Julia steering the ship as the winery is one of the rising stars in the Rheingau, and a member of the prestigious VDP which holds their members to strict quality standards. The estate holds 11 hectares of vines including the world famous Erbacher Marcobrunn site. The domaine is focused on Riesling, with the noble variety comprising 90% of the vineyards and production. The remaining varieties include Spatburgunder, Grauburgunder and Weissburgunder. The vineyards are all picked by hand and all styles of wine are produced from sparkling, dry and sweet. Respecting the land by using natural fertilization and allowing suitable plants to grow between the vines are practiced at von Oetinger. White wines are fermented and aged in stainless steel tanks, while the Spatburgunder is raised in traditional oak barrels. All of the wines show off Achim’s winemaking skill with the attention to detail in every wine. Powerful, focused, and cut like a diamond are all superlatives that have been used to categorize the qualities of the current releases. Sourced from Erbach Steinborn using no malo and stainless steel aged. Very dry with a crunchy mineral finish. Sourced from the edge of the Hohenrain vineyard from 45 year old vines. More powerful than “Losslehm” with defined purity and personality. Like the "Mineral" this old vine bottling is also sourced from the edge of Hohenrain but with a broader expression and more volume on the palate than “Mineral”. With time in glass it opens up revealing layers of crisp fruit and dusty minerality. Sourced from Hattenheim Hassel an Erste Lage vineyard site, the Jott punches above its weight with 4 days of skin and stem contact adding to its complexity. Savory aromas beneath bright fruit and tense acids. Lightly salty yet shy bright fruit aroma. More volume on the palate with a rich texture and a detailed lengthy finish. A tiny amount of oak used here but hard to detect. Forward and ripe aromas backed up by a powerful precise palate with broader shoulders than the Grauburgunder. A miniscule amount of oak used here helps frame the picture. A medium weight direct to press Blanc de (pinot) noir displaying a splendidly lush mouthfeel and texture wrapped around a supple acidic spine. 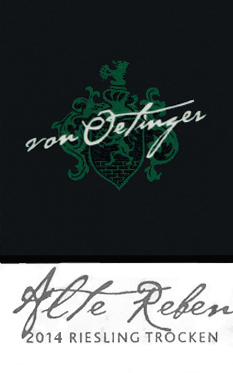 A great introduction to the wines and style of Von Oetinger. The Siegelsberg vineyard lies directly above Marcobrunn, with clay soils and the ideal exposure for optimal sun. The 2011 Erstes Gewachs displays a terrific combination of energy on the palate with acidity that kicks in on the finish. The Siegelsberg vineyard lies directly above Marcobrunn, with clay soils and the ideal exposure for optimal sun. The 2012 is a bit more tightly wound than 2011, with a firm dense palate and a bright spearmint and forward aroma. Decant or cellar for a few years. The Hohenrain vineyard lies above Marcobrunn, on the slope to the north, and contains marl, loam and loess. It is more sheltered than Siegelsberg, and planted on a lesser incline. Although reticent at first, with air it opens up, to reveal delicately pretty fruit on a fine linear frame. More to come from this one. Marcobrunn is considered one of the best vineyard sites for Riesling in the world, with prices rivaling first growth Bordeaux in the 19th century. With its position midslope, and its composition rich in marl, riesling grown here is deceptively powerful, displaying a laserbeam precision that lingers indefintiely on the finish.